If you’re looking for an air conditioning product that is not a large window-mounted unit or a noisy portable AC unit, a ductless air conditioner might be right for you. Ductless air conditioners are unique because they are much more efficient than window or portable air conditioners, more aesthetically pleasing, and because they’re ductless, installation is simpler and less invasive than a central air unit. They’re good cooling options for spaces that use space heaters or radiators in the colder months or for room additions where running additional ductwork could be costly. For those who are very sensitive to noise, a ductless AC unit is probably the best solution because they are extremely quiet. You most likely can’t hear any noise even when standing next to it. But what exactly are ductless air conditioners? How they differ from typical central AC, window AC, and portable AC units? This guide will walk you through everything you need to know about the ductless mini-split air conditioning system. We also review some of the best ductless air conditioners on the market that we think are worth your money. Don’t forget to read our buying guide at the bottom of the article. What’s the quietest window air conditioner? What’s the quietest portable air conditioner? After many hours of researching and reviewing ductless air conditioners, we’ve learned that quiet, affordable and easy to install ACs makes most people the happiest – and we think the Pioneer WYS Series 17 SEER Complete System Set will fit the bill in most rooms. This is a complete set that includes almost everything you need to install the AC and it comes with the instructions that are very clear and detailed. With the capacity ranging from 9,000 BTU/h to 36,000 BTU/h, 120V or 230V, you can easily opt the model that fits your needs. Additionally, Pioneer offers its customers a support hotline to answer any requests in installation, use, troubleshooting, warranty and parts issues. For now, this unit is being evaluated with highest ratings for top consumer satisfaction and ranked as the best sellers on Amazon.com. A ductless air conditioner, also known as a mini-split system air conditioner, has the condensing unit outdoors, much like central air conditioning system. The condensing unit is connected to a wall unit (or an evaporator/air handler) that sits inside the home. The wall unit is connected to the outdoor unit by a small hose running through the wall, so no ducts are needed. The wall unit looks like wall-mounted room air conditioners, only thinner. A ductless air conditioner works in a very simple way. First off, air is taken in from the room through the indoor unit. This air is then transported to the outdoor unit via a series of pipes where it is brought into contact with a series of coils containing coolant. When the hot, humid air inside the room comes into contact with the coils, it transfers its energy to them, turning the coolant liquid inside into gas. The gas is then sent off to the compressor part of the outdoor unit, where it is recycled, using electricity, back into a liquid. The newly cooled air is then fed to the indoor unit (evaporator/air handler), where it is ejected back into the room. With repeated cycles, the temperature of the room falls. While the upfront costs of a ductless air conditioner tend to be higher than those of a portable or window ac unit, there are a few key reasons that many people prefer them. Window and portable air conditioners can be very noisy and annoying, distracting from your ability to relax or work at home. They can also greatly impede on your ability to sleep pleasantly, keeping you awake through the night every time they turn on and shut off. Unlike window and portable AC units, ductless air conditioners are very quiet. Because the major parts of this type of AC are placed on the exterior of your home, much of the operation is performed outside your living space where you don’t have to listen to it. You will likely not even realize that the unit is on while still enjoying the cooled air. Some of the best quiet ductless air conditioners operate as low as 20 dB on the lowest fan setting, such as the Mitsubishi’s ductless split air conditioners, which is even quieter than a human whisper. Our top pick, the Pioneer WYS Series operates at only 24 -27 dB, which is still much quieter than all portable or window units available. Since heating and cooling costs are the largest contributors to home energy bills (nearly half of total costs), energy-efficiency should be a top priority to consider when choosing an air conditioning system for your home. Ductless air conditioners, in general, tend to be more energy efficient than other types of the air conditioner for several reasons. First, a ductless air conditioner SEER rating ranges from 16 SEER to 24 SEER, while central air conditioner SEER rating ranges from 10 SEER to 18 SEER. This indicates savings on electrical costs on the order of 30% to 40%. Portable and window air conditioners have SEER ratings that typically range from 13 SEER to 16 SEER. In general, the higher the SEER, the more efficient the unit, the less electricity the system needs to do its job. Second, some of the best ductless air conditioners utilize pure sine wave inverter technology which is used to control the speed of the compressor motor. Most central, window, and portable air conditioning units don’t utilize this technology. Ductless air conditioners with inverter technology have increased efficiency compared to central air conditioners, have extended the life of their parts and sharp fluctuations in the load are eliminated. This makes the inverter ductless AC units quieter, with lower operating cost and with fewer breakdowns. Lastly, since ductless air conditioners have no ducts, they avoid the energy losses associated with ductwork of central forced air systems. Duct losses can account for more than 30% to 40% of energy consumption for space conditioning, especially if the ducts are in an unconditioned space such as an attic. Installing a central air conditioning system in your home or business is a major undertaking and can disrupt your normal, daily activities. Ducting has to be routed along the walls, or inside them, to connect together the various parts of the system, a process which can take days or even weeks to complete depending on size and complexity of the project. A ductless mini-split air conditioner, on the other hand, is far easier to install. Separate systems can be fitted on a room-by-room basis, and work is often completed in only several hours. You will just need to set the wall unit in place, drill a small hole in the exterior wall and pass the conduit from the condensing unit to the wall unit. 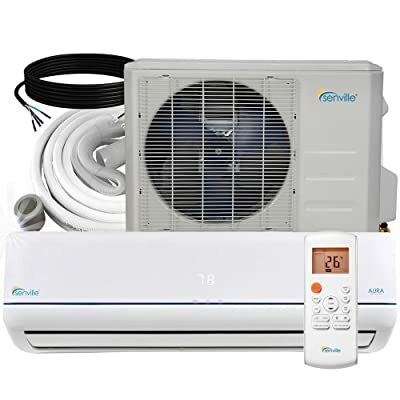 Plus, all the best ductless mini-split air conditioners that we’re reviewing come in a bundle, which include everything you need for installing the AC. There is no need for a licensed HVAC repair and installation contractor. A ductless air conditioner can throw cool (or warm) air into specific areas, the thing that you won’t find with central air conditioners. Central AC units cool your whole home, including areas you rarely use. Not only does this reduce energy waste, but also allows you to maintain the optimum temperature for any area you’re using, when you’re actually using it. Multi-zone ductless air conditioners can accommodate up to four indoor blower units connected to one outdoor unit, each of which can be controlled with its own individual thermostat. If you don’t have central air conditioning, consider using a multi-zone ductless air conditioner to cool different areas of your home—which can be on multiple floor levels thanks to long refrigerant lines. Multi-zone ductless air conditioners are popular in basements, doctor’s offices, and apartments. Ductless air conditioners help to keep your home safer. Through-the-wall and room air conditioners can provide an easy entrance for intruders to get into your house. The hook-up between the outdoor and indoor units generally requires only a 3-inch hole through a wall for the conduit. No one is ever going to fit through such small holes. What’s the smallest window air conditioner you can buy? Ductless mini split systems also offer more flexibility in interior design options. The indoor unit of a ductless air conditioner can be suspended from a ceiling, mounted flush into a drop ceiling, or hung on a wall. In addition, most indoor blowers keep a low profile at no more than seven inches deep and come with sleek, high tech jackets that will enhance the look of any room without being too gaudy and unattractive. The Pioneer WYS model series 17 SEER product line comes in capacities from 9,000 BTU/h to 36,000 BTU/h is our top pick. This unit is one of the best-selling ductless air conditioners in the US and yet one of the cheapest you can buy. Engineered with advanced inverter technology, and an efficient variable speed rotary compressor, this unit is designed not to be a drain on your power bill. Plus, this affordable Pioneer mini-split comes with all the needed parts for installation, the instructions are very clear and detailed, making it an even more cost-effective option. You don’t need special tools or training to install it. The installation process can be done in only a few short hours. With a SEER value of 17, the Pioneer WYS 17 SEER isn’t the most efficient ductless mini-split unit we reviewed. But it’s still more efficient than most central, window, and portable AC models. 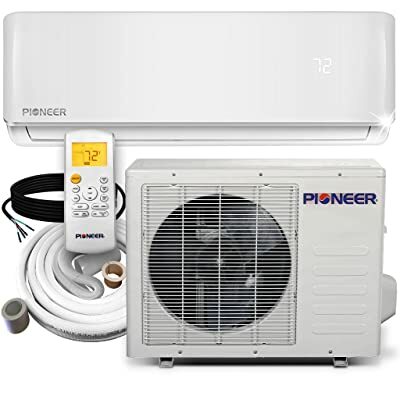 If you want a more efficient model from Pioneer, we recommend looking at the Pioneer WYS Series 22 SEER Ductless Mini-Split Complete System Set. This unit has a SEER of up to 22.5, which is higher than most other inexpensive ductless mini-split systems in the industry. Overall, we’re confident that the Pioneer WYS 17 SEER series is one of the best ductless air conditioners available. Pioneer is one of the pioneering as well as the largest suppliers of ductless mini split and multi-split systems in the USA, since 1995. They have been supplying their ductless mini split systems in many countries and regions long before ductless split systems have become widely available in North America. Another affordable but high-efficiency ductless air conditioner that you should consider is the Senville AURA Series Single Zone Mini Split. With SEER Ratings as high as 23, the Senville Aura surpasses many of the top name brands when it comes to efficiency. It’s also fully certified by Energy Star for the highest levels of energy efficiency. With Ultra-Inverter Technology, you can expect to save upwards of 40% on your energy costs annually. With many such great features, the Senville AURA Series is definitely one of the best ductless air conditioners for you. It is a great companion for you or anyone looking to cool and/or heat their home or business, while minimizing running costs in the long-term. Furthermore, all Senville models are backed by a comprehensive 7-year warranty designed to protect your purchase. This 7-year warranty offers coverage on the compressor and a 2-year warranty on other parts. You can rest assured that your Aura Series mini split will save you money for years to come as an energy investment for your home or office. If you’re looking for a cheaper and lower SEER model from Senville, consider buying the LETO SERIES Mini-Split systems (15 SEER). 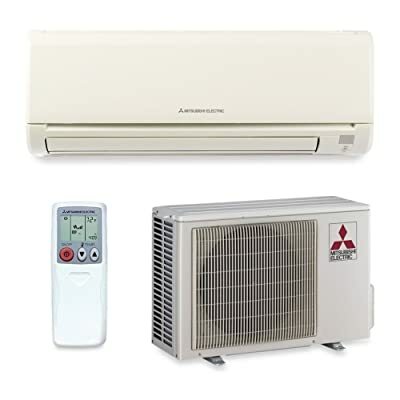 As a leading manufacturer in the ductless mini split industry, Mitsubishi designs and builds ductless mini-split air conditioners that have a great quality. Featuring high SEER and EER ratings, Energy Star rated, Mitsubishi ductless air conditioners often use less energy than models from other brands. They are also significantly quieter indoors and has a wider operating range. However, ductless air conditioners from Mitsubishi tend to be more expensive, can cost up to 2 times as much as Pioneer’s units. The 23.1 Seer Ductless Mini-Split is one of the best ductless air conditioners that Mitsubishi offers to the US market. With a seasonal energy efficiency ratio (SEER) of 23.1 and some unique energy saving features, this unit uses less energy than most other options, a 12,000 BTU unit can be operated for approximately $140 per year depending on your location. Built with Mitsubishi’s M-Series Inverter Technology, this unit’s compressor works in conjunction with the air conditioner’s electric controls to detect subtle temperature changes in your room. Cutting down your energy costs, the technology automatically adjusts speeds for precise temperature control. 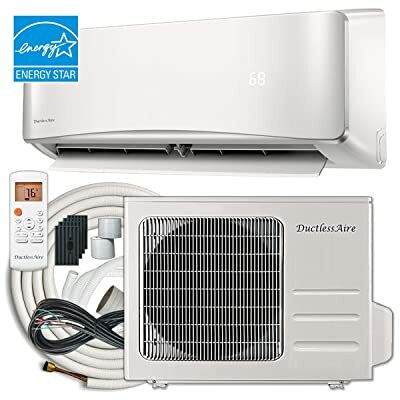 Available at 12,000 BTU, 18000, and 24,000 BTUs of cooling and heating power, the DuctlessAire ENERGY STAR Ductless Mini Split Air Conditioner with Heater is ideal for medium to large rooms up to 1200 square feet, such as classrooms, sunrooms, open floor plan flexible-use spaces, man caves, home theaters, offices, studios, bedrooms, bonus rooms over the garage and even basements and garages where heating and cooling is desired. This is a single zone mini-split ductless system that utilizes the most current inverter technology, which allows the compressor to optimize efficiency and power consumption together, while maintaining the specified output. This allows for much quieter operation and reduced energy consumption. Plus, it meets Energy Star requirements, that means it’s designed to provide maximum comfort without being a drain on your energy bill. 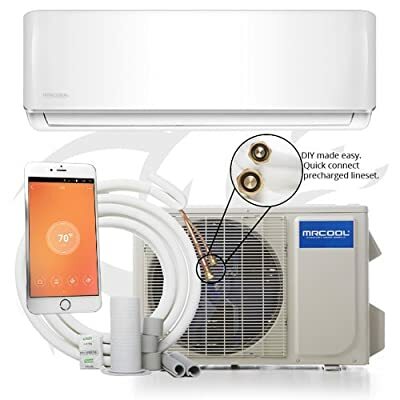 The MRCOOL DIY Ductless Mini-Split with Heat Pump is one of the best ductless air conditioners for anyone looking for a model that can be installed by just one person. This is a rare model that you can install yourself without special tools or training. A detailed installation manual is included since you’ll need to connect the indoor blower unit to the outdoor compressor with refrigerant lines. The 25-foot refrigerant lines are included with purchase. Click here for a step-by-step MRCOOL mini-split installation guide. The MRCOOL DIY Ductless Mini-Split is a single-zone mini-split system with a capacity ranging from 9,000 BTU to 36,000 BTU. It can be controlled via your phone through a specific mobile app. The app is available on IOS and Android, simply download it and then you can easily set up your timer, sleep function, or check the unit’s running status. You can also check your energy usage over time to see when you’re using the most and least amount of energy. How To Choose the Best Ductless Air Conditioner For Your Home? If you’re considering investing in one of the best ductless mini split air conditioners we list above, there are a few main factors you should keep in mind to ensure you get the best unit for your needs. The upfront cost is the main downside of buying a ductless air conditioner. Even the most affordable models will cost you close to $1,000, while higher-end ones come out to around $5,000. If you want a ductless air conditioner that’s powerful enough to cool a large room, or want a multi-zone unit that can handle multiple rooms, expect to pay closer to that high end of the price range. If you want one that also comes with a heat pump for the winter, that will add to the cost as well. You also need to hire an HVAC specialist if you don’t have the skill to install a ductless mini split system yourself. However, since ductless air conditioners are very energy efficient, more efficient than the window, central, and portable AC units. Your energy costs will be lower and save you money in the long run. The best ductless mini split air conditioner for you should have a proper power (BTU) to accommodate the spaces you want to cool. If the size is too small or too large, the AC won’t cool properly, and it won’t operate efficiently. You may not find those numbers to be exact, if you live in a place where temperatures frequently get over 90°, you should add about 30% to the number of BTUs needed for space. But, these numbers should provide you with a good starting point in determining the best mini split air conditioner for your living space. If you don’t have central air conditioning, consider using a multi-zone ductless air conditioning system to cool different rooms of your home. All multi-zone models on the market will allow you to control the temperature of each room distinctly, you can turn the A/C off in any room that’s you don’t use. Multi-zone models are popular in basements, doctor’s offices, and apartments. Many mini-split air conditioners use the standard 110-120 volt outlet, but some larger models require the 220-230 volt outlet. Typically, the highest amount of BTU cooling power supplied by a 115-volt unit is about 12,000, while a 230-volt unit can supply up to 24,000 BTUs of cooling. In essence, if positioned properly, a 230-volt air conditioner may act as a whole house unit (multi-zone) while a 115-volt air conditioner is always considered a room air conditioner (single zone). So you should make sure your home’s voltage matches your unit’s before purchasing. Using the incorrect voltage can cause the circuit to break, a loss of efficiency, or even cause a fire. Ductless or mini split air conditioners are very efficient. Their efficiency is rated by a Seasonal Energy Efficiency Ratio (SEER), which is calculated by the cooling output for a typical cooling season divided by the total electric energy input during the same time frame. In general, the higher the SEER, the less electricity the system needs to do its job. The minimum standard SEER for ductless air conditioners is 13. Most modern ductless air conditioners have a SEER that ranges from 16 to 24, while some of the best ductless AC units have a SEER of up to 30. If a model is extremely efficient, it can become Energy Star-rated. In order to become Energy Star-rated, models must prove to significantly contribute to energy savings and offers products and performance demanded by consumers.